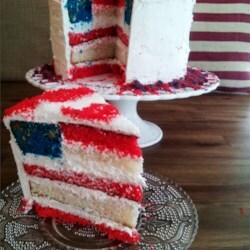 In anticipation of July 4, here is a #patriotic cake recipe with a flag pattern that reveals itself when you cut it that is sure to impress your friends. Nowcado discovered this one on allrecipes.com. Preheat oven to 350 degrees F. Grease and line 4 8-inch round cake pans with parchment paper. Place a 4-inch round stencil on top of 1 thin red cake layer; cut out a 4-inch red cake round. Repeat for 1 blue and 1 white cake layer. Crumble red and blue pieces of leftover cake into 2 separate bowls. Score lines into the top of the cake’s frosting with a kitchen knife to make a flag design on top of the cake. It should have a 2-inch square at the upper left for blue field and white stars, and 7 thick horizontal stripes about 1 inch wide. Fill the square field at the upper left with blue crumbs and press 1 tablespoon white chocolate chips upside-down into the blue crumbs to make ‘stars.’ Fill the bottom stripe and every other stripe with red crumbs to make red stripes. Sprinkle white sugar generously into the white stripes to make them stand out.